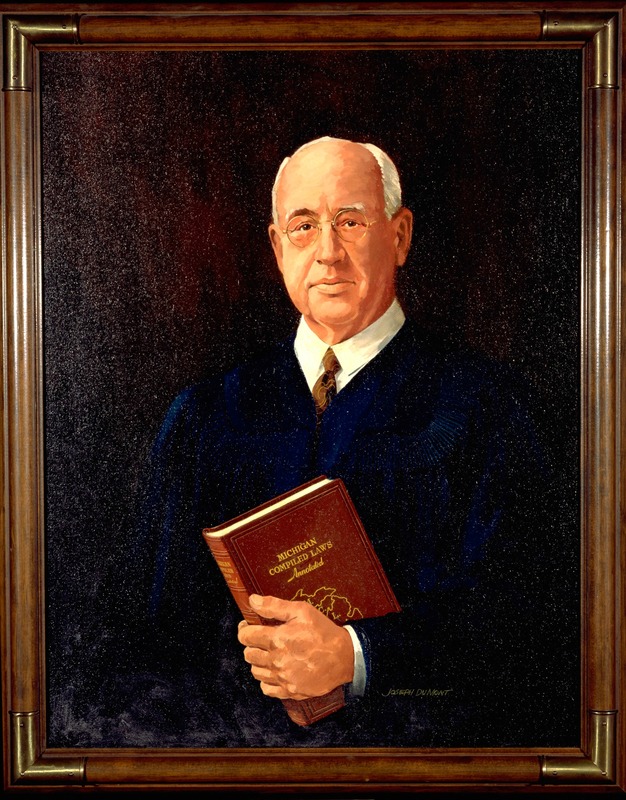 On this date in 1881, future Michigan Supreme Court Justice Emerson R. Boyles was born near Charlotte, Michigan. Boyles worked his way up from prosecuting attorney to probate judge to deputy attorney general under William Potter (who he later would succeed onto the Michigan Supreme Court). Boyles was also quite notable for having authored the Michigan Criminal Index, Probate Blanks, and Probate Manual, as well as supervising the Compiled Laws of 1929 — he is shown holding a copy of that book in his official portrait. Boyles served on the Michigan Supreme Court from August 8, 1940 to December 31, 1956. He was replaced on the Court by another justice well known for his writing skills: John Voelker. Read the transcript of Justice Boyles’ post-humous portrait dedication on September 8, 1982. Boyles died on November 30, 1960.